Can anyone help me find a vintage transmission to fit a early 40's Ford flathead engine? I used to race a Ford flathead, and in an attempt to improve drag racing times, I built an adapter to bolt up a GM 4 speed, so I don't think it would be a problem doing the same for a regular marine trans. 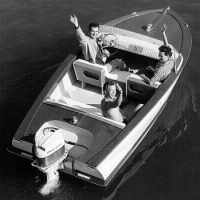 By the way, there were many of these flatheads raced in boats Canada in the 50s and 60s. Try Kijiji in Canada. not exactly what you are looking for but could possibly work for you. I have a complete 59A Ford Flathead with the Lehman Marine Conversion and a Lehman manual transmission for sale. Pictures & info-contact me.